The avalanche of books about John F. Kennedy timed to mark the 50th anniversary of his assassination in 1963 has begun. Among the first is historian and journalist Thurston Clarke’s JFK’s Last Hundred Days: The Transformation of a Man and the Emergence of a Great President (Penguin, 432 pp., $29.95), a friendly look Kennedy’s public and private lives from the first week of August of 1963 until his death on November 22. The main issues JFK dealt with during that time period had to do with various aspects of the Cold War involving the Soviet Union, China, and Cuba; civil rights; and the Vietnam War. The central questions as far as Vietnam War policy was concerned centered on the 16,300 American advisors in the country. JFK basically had three options: Withdraw them, add more advisors, or escalate and bring in combat troops. When he took office in January of 1961, fewer than 1,000 U.S. advisors were on the ground in Vietnam. Kennedy, a resolute Cold Warrior, pledged American support to the South Vietnamese in their fight against the communists and steadily increased the number of American Special Forces and other advisory units sixteen fold in his first two years in the White House. On the other hand, at the same time—and throughout the final year of his life—JFK let his closest allies know that he was seriously considering removing significant numbers of American troops from Vietnam. He also expressed severe reservations about sending in combat troops. Ever since his death, historians have debated the unanswerable question: What would JFK have done in Vietnam had he lived? Even though no one can definitely answer that what-if question, some Kennedy partisans have argued that JFK would have withdrawn the advisors and never would have escalated as his successor Lyndon Johnson did in 1964 and 1965. Clarke firmly stands in that camp. His analysis of what JFK would have done cites the opinions only of those who came to believe that JFK would have withdrawn the advisory personnel and would not have escalated as Johnson did. That list includes LBJ’s Secretary of Defense Clark Clifford (also a Kennedy confidant), Kennedy and LBJ Secretary of Defense Robert S. McNamara, U.S. Sen. Wayne Morse of Oregon, former Deputy Secretary of Defense Roswell Gilpatric, former Texas Sen. John Connally, JFK and LBJ high-level national security man Walt Rostow, LBJ’s National Security Adviser McGeorge Bundy, JFK-friendly historian Arthur Schlesinger, America’s anchorman Walter Cronkite, and Robert F. Kennedy, JFK’s brother. Even though all of these movers and shakers were close to one or both of the presidents their opinions are only that—opinions. Until and unless some undiscovered definitive Kennedy speech, letter, or conversation comes to light, the answer to the big question of what he would have done in Vietnam remains unanswered. Robert M. Neer’s Napalm: An American Biography (Harvard University Press, 352 pp., $29.95) hurls the reader into the heart of darkness as he tells the life story of napalm, the incendiary jelled gasoline that was developed in World War II and employed extensively—and sometimes infamously—in the Vietnam War. The author—a lawyer and historian who teaches at Columbia University—uses in-depth research and straightforward narration to tell the story of napalm. While Neer never condemns anyone, his choice of quotations, information, pictures, and events tells us where he stands on the use of this fearsome weapon. Lewis Fisher was the man who measured up to the challenge of developing napalm during the early years of World War II. The author tells us that the first successful experiment of napalm took place on July 4, 1942, on a Harvard University soccer field. Napalm was used very successfully against the Germans and Japanese. To the front-line soldier, napalm was often life-saving and the only way to flush out the enemy. War, Neer reminds us, often brings out the worst as well as the best among those who take part in it. Robert Scheer, a veteran of Okinawa, described his men watching a fleeing Japanese soldier turn into a torch. They spontaneously cheered. Precision bombing with napalm proved to be very difficult. The solution turned out to be bombing large areas including the target. The author describes the sustained, ten-day napalm bombing of Tokyo and other large cities. Neer says that the atomic bomb got the press, but napalm did the work leading to Japan’s surrender. Neer describes in detail how napalm runs took place in the Vietnam War. Oftentimes, after a napalm run, a pilot was given a cold beer while his armaments were replenished, and the plane was back in the air within twenty minutes. Thanks to television and front-line reporting, Americans saw first hand a lot of the battlefield horror of the war in Vietnam, including the effects of napalm. One battlefield observer, Neer reports, entered a burned-out village where pigs were eating the roasted bodies of human beings. A worldwide effort was made to ban the use of napalm. Neer notes that the United States has abstained from most of the voting on making napalm illegal. Presidents Clinton, Bush, and Obama have had parts in outlawing the use of napalm, but each has insisted on some exceptions for its future use. This book is well-written and should be read, but I found it difficult on many emotional levels even though it deepened my compassion for my fellow human beings. The book clearly shows why we must never give up the search for better ways to resolve conflict. The final pages of the book contain profound thoughts by Kim Phuc, providing the only ray of light I found in the text. Kim Phuc is the famed “girl in the photograph,” captured as a nine-year-old running naked and screaming from her napalmed village. The photo made international news during the Vietnam War and became a catalyst for antiwar protests. I cried when I read that. I also prayed that someday I will wake up and realize this book was only a work of fiction. We are not told Scott’s Riley’s MOS in this memoir until page 105. I wish the authors had front-loaded the fact that he was in the infantry, along with other basic orienting facts. We don’t learn he has a girlfriend at home or that he is from Mamaroneck, New York, until page 120. We never find out what happened with the girlfriend. That is one of many mysteries in this memoir. Scott Riley calls Vietnam“This thing, this war, this country… my great adventure.” He goes on to tell an incredible outlaw tale of heavy drug use, thievery and murder, most of it taking place in the back alleys and flimsy dwellings of Qui Nhon. Scott Riley went AWOL from A Co., 1st of the 5th of the 1st Cav. He is not precise about how long he was AWOL, nor about how he avoided prison when he returned to the United States. He does say he expected to spend a long time in Leavenworth, but that never happened. The great strength of this memoir is its emotional honesty on every page. There are not a lot of African-American Vietnam War memoirs. Few, if any, contain a detailed description of what it was like to be in the Long Binh Jail during a protracted riot. Scott Riley gives us all that and more. He describes his transition from a scared FNG to a seasoned warrior taking the point and descending into a tunnel with a flashlight to ferret out hidden VC. We learn the details of his life “going native” and living with a wife, a Khmer drug dealer. There are enough details about various forms of drug use to serve as a user’s manual in how to shoot up and how to cover tracks after a multiple drug murder. There also are harrowing accounts of Scott Riley’s struggles with drug overdoses and malarial fever. Later, we learn that Riley came from a middle class family in Westchester County, New York, was a latch key child, an only child, and spent a lot of time by himself. He tells us of his reading: The Iliad and The Odyssey, El Cid, Davy Crockett, Daniel Boone. He makes passionate references to films, including the classic John Wayne western, The Angel and the Bad Man, to illustrate his own situation as an outlaw. He also trapped muskrats, rafted and fished, and built forts and tree houses. Then his family moved to Mamaroneck, New York, where he left behind the idyllic Huckleberry Finn life and was forced to become a “cool kid.” He started saving his money to buy cool clothes. He felt a deep hollow inside; he filled it with drugs. The most moving part of the book—and the part that benefits most from the three authors’ contrasting points of view—is a visit to The Wall in Washington and the search for the names of Scott’s fallen comrades. I shed a few tears reading that section. I’ve read many accounts of families visiting that Wall, and this is easily the most moving. I’ve also read many accounts of families riven by the aftermath of the Vietnam War, and I was much impressed that Scott is now clean and sober and has been working for years in Manhattan as a chef/food coordinator and that his two daughters are both successful, college-educated professionals. I admit to feeling twinges of envy reading of Scott’s twin daughters’ steadfast love of their father and their forgiveness of his sins, despite his thirty years as a junkie and living a life of homelessness and thievery and neglecting his parental responsibilities. I highly recommend this fine memoir that tells a violent, drug-filled tale of how a tall, beautiful, smart, talented young man from a “staunch Bible-toting family” took the road from high school to art school where he learned to be a fine illustrator, to being drafted into the Army at the height of the Vietnam War and being dropped into the Central Highlands with no real preparation. Scott Riley survived all the Army threw at him and he survived all the horrors that he brought down on himself by the bad choices he made. Read this powerful story of a relentless survivor. This immense, 900-plus-page trilogy adds up to one giant book, so we are considering all three volumes in one review. At first, the narrative seems to be no more than a vast memoir of everything that happened to the author, G. E. Nolly, during his two tours as a U.S. Air Force 0-2A and F-4 pilot in Vietnam. As I read further into the trilogy, I changed that judgment. These books, Nolly says, were “inspired by actual events,” but much of what happens is preposterous and unbelievable. I never felt that I was reading the Catch-22 of the Vietnam War, but I did feel that the author had spent a lot of time in the air, perhaps more than Joseph Heller did in World War II. The masterfully written cover blurb on the first book—Hamfist Over the Trail: The Air Combat Adventures of Hamilton “Hamfist” Hancock (Create Space, 266 pp., $10.95, paper)—tells us all we need to know to enable a potential reader to decide if this is the book for him or her. Almost all of the pilots in this trilogy have ridiculous nicknames of this sort. Apparently it was part of the mystique of being a pilot. I was in the Army and never experienced any of the detailed and well-delineated stuff that Nolly lays out for us in the three books. I’ve read a few novels and memoirs about FACs in the Vietnam War, and this one holds its own with the best of them. The dangers, as well as the perquisites, are presented, right down to the tiniest details of the air-conditioning and the all-you-can-eat meals available 24 hours a day in the officers’ mess for 27 cents a meal. Hamfist Down! Evasion, Survival and Combat in the Jungle (CreateSpace, 238 pp., $10.95), the second book in the trilogy, is a continuation of the first one. It’s as though one book was just arbitrarily broken into two parts. It’s now August 1969, and Hamfist Hancock has been shot down over Laos. Nolly compares Hamfist’s experience to his boyhood adventures after coming home from seeing a John Wayne movie. Hamfist is very honest about his shortcomings, such as difficulties with reading contour lines on a map, and does not rate himself super highly as a FAC. This volume reminds me of the classic Vietnam War memoir, BAT-21, which was made into an exciting 1988 war rescue movie starring Gene Hackman and Danny Glover. 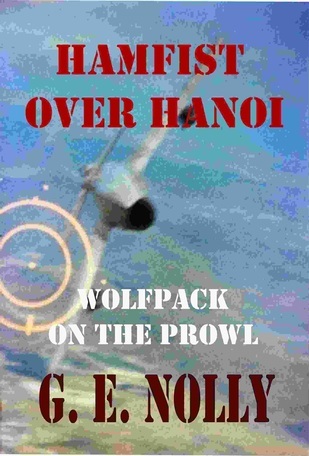 Hamfist Over Hanoi: Wolfpack on the Prowl (CreateSpace, 420 pp., $17.95, paper) is the third book in the trilogy. It’s now 1972. Hamfist is back in action after his adopted son is killed by a rocket attack. 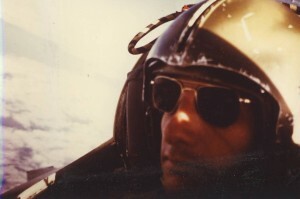 He flies an F-4 Phantom II from a base in Thailand just as Operation Linebacker starts. The book contains a heavy load of information on how to fly an F-4 fighter. I cannot imagine anyone reading it and wishing for more detail. A glossary of terms would have been appreciated by this reader. The book never convincingly makes the cases that Hamfist adopted the kid. Hamfist visits the child a few times in an orphanage and that is about it. When I was in Vietnam for thirteen-and-a-half months in 1966-67, it seemed apparent to me that the war was hopeless and well on its way to being lost. But this Air Force officer is enthusiastic about the war in 1972. We called this a lifer attitude in Vietnam in 1967, which I acknowledge is the unenlightened opinion of a draftee who only had a rudimentary four-year education at a state university and just one semester in Air Force ROTC. These books show also no respect for antiwar protesters, conscientious objectors, or for Jane Fonda, who gets a two-page rant in which she is called a traitor and compared to Tokyo Rose. After reading this 900-plus page opus, I feel no need to ever read another book on the air war in Vietnam. I recommend highly this trilogy to anyone who wishes to know all there is to know about the attitudes and daily activities of those who flew airplanes in the Vietnam War. J. Max Taylor was an Army “intelligence editor” based in Korea but was called into Vietnam (and Laos and Cambodia) for difficult, behind-enemy-lines missions. In Inside the World of Mirrors: The Story of a Shadow Warrior (Authorhouse, 150 pp., $27.99, hardcover, $16.95, paper) Taylor gives blow-by-blow accounts of about a dozen harrowing missions in which he was called upon to do dangerous undercover work, including assassinations. On one mission, Taylor and his small team were directed to assassinate a Chinese bigwig inspecting NVA training facilities. They were successful. Even more intriguing is how Taylor and his men escaped afterward, when the enemy knew they were near. To do so, Taylor relied heavily on Montagnard scouts as point men. He hid during the day, sleeping on his stomach because he was less likely to snore in that position. He describes moving around enemy patrols at night, inch by inch, with every piece of equipment taped to muffle sound. And he learned how to take out sentries silently. On a similar mission inside Cambodia, things didn’t go well, and Taylor watched as his men were picked off one by one. Though Taylor never really characterizes his fellow soldiers, you can feel his agony when they die, and his resentment over what often turned out to be futile, senseless missions. Taylor was eventually mustered out because of a severe injury he incurred in Germany. He doesn’t go into details about the injury, but it sidelined him for a long time. And then his nightmares started. He’d killed a lot of men, watched as a lot of friends died, and had little sense of the big picture. In large part, Taylor wrote this book to exorcise his demons. After Vietnam, Taylor took on Cold War missions in Romania, northern Ireland, Libya, and the Basque country of Spain—even the Vatican. These accounts read less like jungle warfare than spy stories. His fascinating tale of “the troubles” in northern Ireland, for example, with the understated title “A Visit to an Irish Pub,” is almost a classic stake-out. Taylor is not a great writer, but he could be. Once he gets his logistics out of the way, he describes each mission with precision and objectivity, and he’s riveting. Would-be thriller writers should take a look. 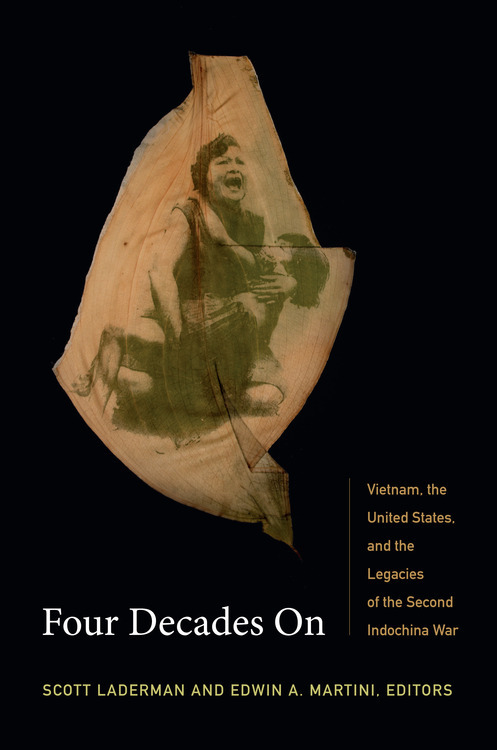 Four Decades On: Vietnam, the United States, and the Legacies of the Second Indochina War (Duke University Press, 334 pp., $89.95, hardcover; $24.95, paper) is a collection of essays by historians, anthropologists, and literary critics dealing with—as the subtitle indicates—a common theme: post-1975 events surrounding the Vietnam War. In keeping with the prevailing view of the history establishment, the book contains essays that deal, mostly in an academic way,with varied aspects of the war—not just the American experience. So we have —among other things—entries that look at the building of the new communist nation of Vietnam in 1975; the evolution of the so-called postwar “Vietnam Syndrome” in the United States; the transnational legacy of Agent Orange; and the birth and growth of the POW/MIA movement. In addition to Franklin, Laderman, and Martini, the contributors are Alex Bloom, Diane Niblack Fox, Walter Hixson, Heonik Kwon, Mariam B. Lam, Ngo Vinh Long, Viet Thanh Nguyen, Christina Schwenkel, and Charles Waugh. In Lessons From the Hanoi Hilton: Six Characteristics of High-Performance Teams (Naval Institute Press, 184 pp., $27.95) Peter Fretwell and Taylor Baldwin Kiland look at the experiences of the U.S. POWs in North Vietnam and come up with six general characteristics that helped many of them survive. Although the book describes the actions of many POWs, Fretwell and Kiland repeatedly turn to James Bond Stockdale. Admiral Stockdale, who received the Medal of Honor for his courageous leadership in the Hanoi Hilton, was shot down on his 200th mission over North Vietnam in 1965 and held until 1973. Stockdale, who was tortured repeatedly, took the role of commanding officer behind bars. He developed a guiding principle that he and many of the other POWs used based on his study of the Ancient Greek Stoic philosopher Epictetus, who preached selflessness, steadfastness to a belief system, and rigorous self discipline.